Shoes orthopedic intended for anatomically and functionally inferior extremities. It helps to fix the initial unstable deformations, prevents progression them, creates stability when standing and walking. The main indications for orthopedic footwear: platypodia, clubfoot, hollow foot, the heel of the foot, the curvature of the fingers, unequal sizes stop stump foot, shortening the length of the limb vascular disease (enteritis), braces, prosthetic. Direction to order orthopedic footwear receive from your doctor. In orthopedic workshop or in the medical Department of prosthetic enterprise removed measurement, Ocherk, imprint or, in complicated cases - cast. Measuring with both feet, Oboth in socks, produces tech-prosthetist. Orthopedic shoes should match the shape and size of the patient stops, to be quite lightweight, flexible, durable and is not deformed in the process of wearing. The inner surface of orthopedic footwear should be smooth, without rough seams; painful places foot inside the Shoe released by squeezing - "valokuvaaja" depressions over Namin, deformed fingers, bone ribs. The top of any orthopedic footwear is made from soft grades of a leather (chrome, Yalova leather, calfskin); for backdrops, sometimes for lateral parts of footwear use hard skin (shaft). For insoles are used leather, duralumin, cork, Filts, rubber, plastics. TANCI (artificial thrust) are made of elastic materials to perform the role of "external muscles". The more complex the deformation, the required more accurate manufacture or selection pads orthopedic shoes. The issuance of orthopedic shoes by the doctor; the patient should be like in orthopedic shoes at least a half hour. Here, the patient must receive the necessary instructions on hygiene stop and orthopedic footwear. Fig. 1. Skin-metal instep and bottom view; b - a view from the inside. Fig. 2. Supplementary cork insole with flat feet. Fig. 3. Orthopedic shoes with clubfoot. Fig. 4. Corrective traction and unbending horse's foot; b - planiruyushaya foot internal clubfoot. Fig. 5. 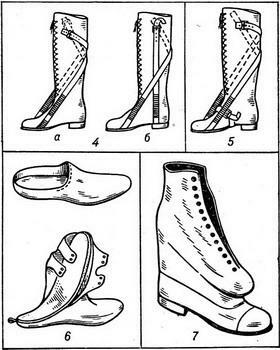 Shoes with triple thrust (unbending, bending and directly pressing on the body), contributing to the reduction of the code in the hollow stop. Fig. 6. Supplementary devices with amputation defects of the foot. Fig. 7. Orthopedic shoes when LLD ("dual-track"). With deformation of fingers (corns, hammer, valgus), mild flat feet can make use of corrective devices - arch supports and inserts (Fig. 1 and 2)placed in regular shoes, which thus becomes simple orthopedic. These shoes can be produced and the factory method. The most common Deposit orthopedic products for shoes is the instep - insole lifting the inside edge of the foot. When expressed as flat feet, in addition to the instep, calculations of the arch in orthopedic shoes, make the relative heel height of 2-3 cm inwards. Over wystawie fingers expand, tip toe. If clubfoot (Fig. 4, b) shoes do with rods, kokami of tubes with outer edge of the soles. If the deformation is fixed, shoes must exactly repeating the contours, what orthopedic shoes made obligatory by cast (plaster negative, or on foot print in plaster paste), making a wide toe, I repeat varus block (Fig. 3). Well-made orthopedic shoes helps to consolidate the achieved results of conservative and operative treatment of deformity. When hollow stop, if the deformation is malleable, use of thrust (Fig. 5)give support to a stop at the edges and thus contribute to the continuous correction of foot under the influence of patient's weight. When fixed hollow foot invested cool layout of the code, and under the heads of the first and fifth metatarsal bones, where there are always this Namin, do deepenings. When the horse, foot protruding use of thrust (Fig. 4, a), it is sometimes useful to improve shoes on his good leg double taps. To equalize the length of the legs are kokami under the heel. In congenital shortening of the foot toe shoes make the tab; with amputation defects of 1 finger and just the forefoot orthopedic shoes supply springy metal plate, and boot with the workpiece in the form of envelope make a tab from Fils - Deposit slipper (Fig. 6)to repair the defect, to fill it. Paralysis, restricting movements of the foot, when ankylosis of the foot at an angle of about 100 degrees should facilitate the bringing sick, weakened feet above a support to sock it not been marked for the land; for this leave about 2 cm of its length uncompensated or even just increase the heel for healthy feet; if necessary, to compensate for a small LLD (2-5 cm) under the heel make the Cosquer; when cut to 18 cm under the entire footprint of the make cork Cosquer in the form of "wedges". For large shortenings shown purpose shoes with "dual track" (Fig. 7), or orthopedic apparatus. There are prostheses for shortened limbs. They are used if it is possible to place the knee joint at the appropriate level. Orthopedic footwear is designed to stop pathologically changed. It should be light, durable, comfortable, cosmetic bag. Its purpose - to save the corrected position of the foot, to fix the results of treatment, to fill in the existing defects of the foot, to compensate for shortening. Orthopedic shoes should match the size and shape of the foot. For manufacturing pads bushel shoot with both feet corrected in their position. Determine the length of the foot, the circle in the area of the metatarsal heads, at the level of the scaphoid, through the ankle and heel spur, the circle above the ankles. Make an imprint and Ocherk foot. For the manufacture of sophisticated orthopedic O. make a negative, applying the plaster socket (see Plaster technique). Before setting bandages foot hold in the corrected position. After hardening of plaster negative cut. Plaster make positive to negative (imprint) (Fig. 3). If you need to reflect the slightest details of the shape of the foot, then produce an impression. Stop put in plaster porridge. By hardening the plaster cut. Negative finish in form and cast a positive. Fig. 3. Plaster model for the manufacture of orthopedic footwear: 1 - mould; 2 - positive. For the top orthopedic footwear is used soft skin - kid, suede or stronger - chrome, Yalova leather, calfskin. Painful places must be unloaded from the pressure using the corresponding recesses. Insole is made of soft material - tube, Filts, felt, sometimes, of cellular rubber or plastics. The heel can be attributed to the side, extended, upgraded with one hand. Orthopedic shoes and arch supports are manufactured on orthopedic enterprises, factories orthopedic O., workshops with special equipment for the purpose of physician and the physician of the medical Department of the enterprise. Shoes when shortened limbs. The degree of shortening determine dimensions and putting under the soles of flat plates in such quantity that the front to the top of the iliac spine bones with the vertical position of the patient was on the same level. Shortening, which is compensated by the plantar flexion of the foot, measure, enclosing under the heel wedge-shaped tablets - Koski. When shortening up to 2 S. under the heel in the ordinary O. invested tube. When shortening within 2-5 cm appoint orthopedic shoes with Coscom under the heel. When shortening 6-18 cm wedge-shaped tube is placed under the entire trail, but under the heel higher than for fingers. When shortening over 18 cm appointed Acting with double track (Fig. 4) or the device. The insole in Acting produce respectively relief soles with laying of the vault and recess of the heel. When the restriction of joint motion leave shortening of 1.5-2 cm to avoid touching toe walking. Shoes when the defect after the amputation of fingers at the level of the joints of Lisfrank and sopara. Defect separate limbs or all fingers except the big one, does not require orthopedic shoes. If a defect thumb sole O. strengthen the metal plate. When healthy stumps foot billet Grilles is of the type of envelope. In a sole put a metal plate around the track. Defect fill tube or Fils. Sock - with one or two finger bends, the vault is filled with the layout. To prevent slipping off stump foot forward is the anterior hard valve. After surgery to Pirogov appoint special devices. Shoes when the horse's foot. Vicious position of the foot at an angle of up to 100 degrees offset by the increase in the height of the heel in normal Acting or supplementary Coscom under the heel. When pes equinus within 100-110° appoint the Cosquer under the heel of the patient's legs. To equalize the length of the extremities it is necessary to enclose the Cosquer and under the heel healthy feet. When the horse foot with an angle of 110 to 130° appoint orthopedic shoes with a stopper on the trail of the foot or with hard Barzani, and over 130 OC orthopedic O. since hard Barzani or tires. Shoes internal clubfoot (pes varus) is made with a wide toe on the block, made in position valgus. When fixed nedviprasmiskai deformation O. produce the cast. Avenirovna compensated cork Coscom. Back from the interior continues to head I metatarsal bone, outside before the Foundation of the V metatarsal bones, preventing the conversion of the forefoot (Fig. 5). For elastic re-rolling tube put up metatarsophalangeal joints, and anterior fill soft lining. The area of a support foot increase with the help of cork pronator. Fig. 5. Shoes with clubfoot. To keep the correction of the heel and foot is internal lateral support. When fixed nevirapine deformation - side corset. The backdrop should fit to cover the heel. Figure canted outward heel extended outside until the middle of gelenke. Shoes for flat feet. With flat feet of I and II degree - invest in the ordinary O. the instep, made from cork, leather, felt, rubber, plastics, metal with leather and other materials. With flat feet of I degree of internal heel raise the instep to 5 mm, and perednezadny - up to 8 mm for flat feet of II degree in the arch supports make the layout of the code. When the longitudinal and transverse platypodia make the layout of both bodies. In case of flatfoot III degree prescribe orthopedic Acting on the individual Board or gypsum negative; Deposit - taking into account the relief of the plantar surface. The laying out of the vaults inexpedient, as the flat foot is fixed. Heel include medially, its height 2-4 see If the transverse platypodia appoint the instep laying out in the front part of a foot behind the metatarsal heads. This display has a fan-shaped, to the middle of the foot, it narrows region flat. When hallux valgus O. do with laying arches, bringing anterior. Thumb is a small allowance. The backdrop should close-fitting heel. In the area of head I metatarsal pad made wider, pressed against the skin from the side of the workpiece and soles. When corns, hammer and claw-like fingers appoint the Acting high or high hard-toe with laying arches and deepening of the insole for fingertips. When the heel spore to increase the area of support and unloading heel appoint lay-vaults. Depending on the location of the spurs do deepenings in the sole or heel. When hollow foot and I deformation appointed a Lord without calculations of the arch in which front-inner edge raise 5-8 mm, and the posterolateral to 5 mm With II degree, when there avenirovna, bringing feet, to take measurements should, achieving a possible correction, and O. designate an internal hard berets, extended to the beams; the top of a boot strengthen in front-internal Department (hard sideways). In severe forms a hollow foot O. do on plaster cast, appoint pronator and laying out of the vault. With significant varuse heel heel include outwards and appoint internal lateral support. When a paralyzed foot protruding not exceed 130 degrees) recommended O. rigid system without metal fixtures, berec bilateral, internal or rear. When sagging over 135 degrees O. do with a hard corset, tires and rubber hoes to support feet in the correct position. When related deformations add corrective details. To prevent deformation of the skeleton of the foot is used tires with metal hinge in the ankle joint and a metal plate at the base (Fig. 6). When the heel foot appointed Acting with metal tyres, bounding back bending without limitation plantar. Stop put in eqwinus position. When shortening the Cosquer under the heel of the tube without calculations pogo vaults. In the absence of shortening Koski under both heels. Under beams - Filts, felt for the best roll. Sides should grasp the lower third of the Shin. Swelling of the feet in the shoes of O. provide for the admission of internal dimensions. In the upper part vamp put a Shoe rubber.